"The females of nigrofulvus [note: the proper spelling of the specific name is »nigrofulva«] were found by Mr Roberts in tubular retreats provided with a well-developed trap-door. The door is very large but thin, becoming very delicate and flexible at the margin which presumably overlaps the entrance to the retreat: the shape is subcircular or more or less D-shaped. The area of a large specimen is about equal to that of a five-shilling piece." "Found in a trap-door nest at Ashton by myself in November, 1902. [...] Nest a cylindrical tube, 17-18 cm. (7 inches) deep, widening slightly towards the opening but not funnel-shaped, strongly inclined and descending towards the hinge-side at an angle of nearly 45 degrees, much as in Gorgyrella. Lid flat, oval in outline, but broadly truncated at the hinge, its diameter taken at right angles to the hinge equal to the diameter taken parallel to the hinge (each being 19 mm.). The under side of the lid is lined with white silk, but the upper surface is rough and covered with clay. At the edge the lid broadly overlaps the edge of the hole. Width of hinge about 13 mm. ; diameter of hole at 1 cm. from opening 13 mm. ; width of hole at opening 15 mm. ; width of carapace of occupant 5.5 mm." There is also a known ornithoctonine trapdoor spider first reported by Carl Portman (2001) in the BTS Journal. According to Volker von Wirth, it's an Ornithoctonus sp. Furthermore, Patrick Gildenhuys has communicated to me in e-mails that he has found Harpactirella and Brachionopus specimens in trapdoor burrows during his trips in South Africa. Hewitt, J. 1919. 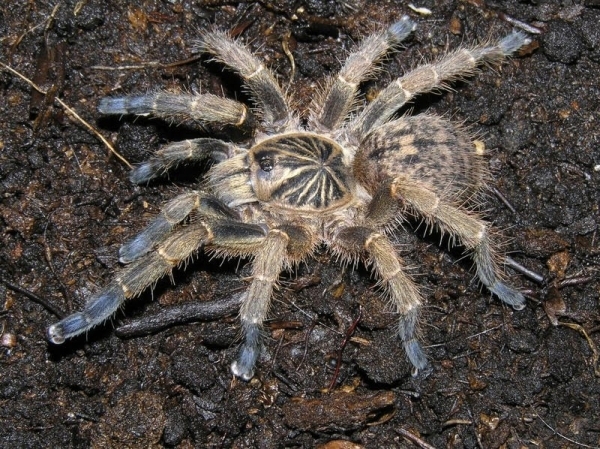 Descriptions of new South African Araneae and Solifugae. Annals of the Transvaal Museum 6: 63-111. Purcell, W. F. 1903. New South African spiders of the families Migidae, Ctenizidae, Barychelidae, Dipluridae, and Lycosidae. Annals of the South African Museum 3: 69-142.